The very lucky winners Justin Hunter and Nikita Brocco, were drawn at random and have recently returned from London, Scotland, New York and Dubai, where they spent 12 unforgettable days, courtesy of Glenfiddich South Africa, learning more about the World's Most Awarded single malt Scotch whisky. Here’s a look into their incredible journey. London was our first stop, and what better way to start the holiday than with a mini-drive-by tour from our friendly chauffeur while on the way to the Radisson Blu in Leicester Square (We definitely felt like royalty!). Big Ben, The House of Parliament, Buckingham Palace, Trafalgar Square and more... On our first evening out, we were treated to simple perfection at Marco Pierre White's London Steakhouse Co. where we enjoyed our first whisky of the trip! The Whisky Mac cocktail made with whisky, ginger and wine and (if you can imagine) the food only got better from there! Scottish eggs (yummy), fish and chips (yummier), Cumberland sausage pastries (yummiest), blackberries, local cheese, ale, custard doughnuts and sticky toffee pudding were just some of the mouth-watering foods we tried on our London Secret Food Tour, while taking in the views of Borough Market, London Bridge and Tower Bridge on the River Thames, the Gherkin, the Shard, Southwark Cathedral, Sir Francis Drake’s Golden Hind and the Battleship HMS Belfast. Our early morning run was one of our highlights where we got to see peaceful beautiful London while everyone was still asleep. A complete contrast to London's nightlife where we partied all night at The Back Room and Sketch in Mayfair. Scotland was the biggest surprise - completely unassuming and gorgeous no matter where you look! Our chauffeur, Bill, picked us up at the Aberdeen airport and gave us a history lesson of the beautiful highlands *with a very heavy Scotsman accent - which we are proud to say we can now understand! * FYI: There are 5 million people in Scotland with 7 million sheep! The Copper Dog, at the quaint Craigellachie Hotel, is where we had the best meal of our lives (to date)! All we can say is... You have not lived until you have tried Angus beef! Angus beef carpaccio, Shetland mussels with white wine, rib eye steak and north sea langoustines (paired with some Monkey Shoulder) made us the happiest travelers in Scotland! Over and above the food, the River Spey, Balvenie Castle, Craigellachie Bridge, the Malt Kiln House, Dufftown Clock Tower and the rolling hills, endless meadows of barley and purple heather created the most magical bubble for our three-day stay! Then the moment we had been waiting for had arrived and we were off to the home of Glenfiddich for the ultimate whisky experience. Our tour guide, Fergus, dressed in a traditional Scottish kilt, took us back in time, sharing the story of William Grant and his family. At this point, two regular whiskey drinkers (that's us), completely fell in love with the family heritage. The highlights of the tour were definitely bottling our very own 1997 and 1998 whisky from the casks (using the copper dog); the whisky tasting with canape pairing; and learning the technique and process of the Solera Vat. The perfect day came to an end with some fish and chips, roasted grouse and Pimms cocktails on the deck of the Dowans Hotel. We had so much fun with Jörg at Sporting Scotland where we attempted (and successfully completed) a number of activities from clay pigeon shooting and archery to blindfolded 4x4 Landrover driving and riffle shooting. Followed by burgers, chips and beer at The Mash Tun! We will definitely be revisiting Scotland soon! New York started off with a street hot dog in Times Square while in complete amazement as to how BIG everything is! (We felt like we were on the set of a movie). 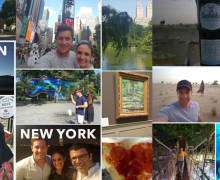 It was GO GO GO for three full days... Babbo for Italian food, Viceroy Rooftop Bar for champagne; Central Park for a walk; The Met Gallery for some art viewing (particularly the Water Lilies by Monet); Little Italy for a pizza slice; The Chefs Club for some cocktails; Pearl Oyster Bar for the best lobster roll in town; Broadway and 5th Avenue for some shopping; and Grand Central Station for some photos. On our last night in NY, Allan spoilt us with a Glenfiddich whisky experience - New York style. We started at the luxurious Nomad Hotel Library bar with a 12-year-old Glenfiddich and some amazing bar snacks! We then made our way to the East River for an evening cruise, despite the rain which lasted all of 15 minutes, it definitely was the most incredible way to see the bright lights of the big city that never sleeps! We could not have asked for more... A Glenfiddich whisky tasting while passing the brightly lit Statue of Liberty and Ellis Island! But we got more... American Hackleback Caviar, Rabbit Cuban Sandwich, Sugarcane Gulf Shrimp on Watermelon at the best cocktail bar in the world - The Black Tail! Allan, thank you so much for an evening we will never forget; for the cocktail book/menu - which we will definitely put to use very soon; and for the gift that you left at reception for us! 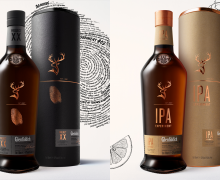 We can not wait to enjoy the Glenfiddich - 14 Year Old Bourbon Barrel Reserve! We arrived in Dubai with just enough time to shower before Chris fetched us for the Glenfiddich Dubai experience. So little time to experience all that Dubai has to offer, but we personally could not have thought of a better Dubai experience than dune bashing and a barbecue in the desert with Chris, Richard and Jan... Oh and our new friend Glenfiddich Snow Phoenix. We were even lucky enough to stop and greet some camels on the way! 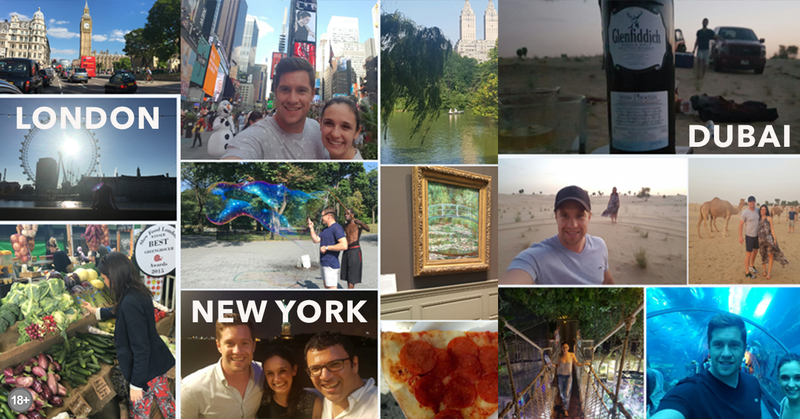 So after 12 extraordinary days of traveling, sight-seeing, eating, drinking, walking and being absolutely amazingly entertained. We decided to use our last few hours in Dubai to... shop! And where better than at the biggest mall in the world with its own aquarium and indoor zoo! It was home time... And what a great send-off to see the night lights of the Burj Al Arab and Palm Island on take-off! Chris, Jan and Richard, thank you so much for the unique evening that you planned, it was so nice to sit back and relax in the open desert and it was the perfect ending to our amazing adventure! 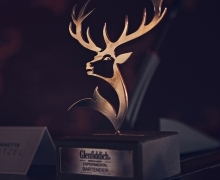 We can't thank the Glenfiddich family enough for this once in a lifetime opportunity! We will never forget it!